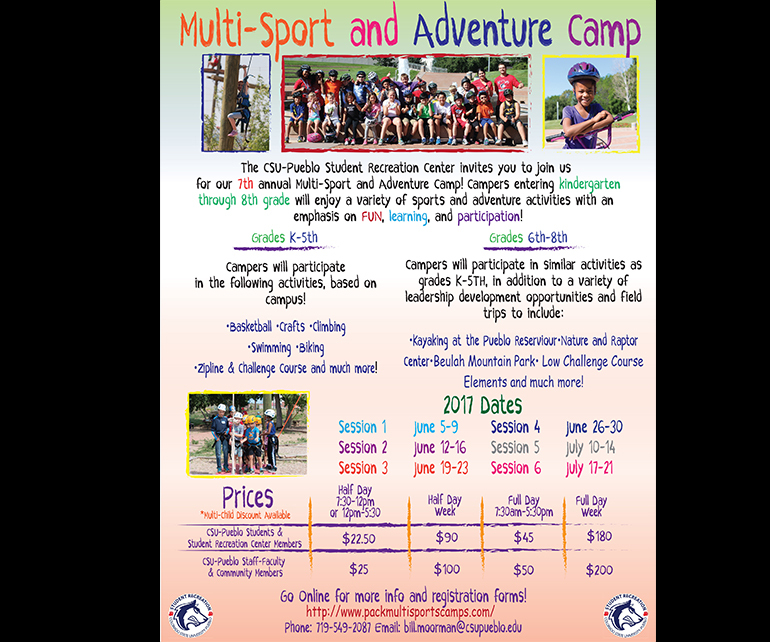 PUEBLO – The Student Recreation Center (SRC) at Colorado State University-Pueblo again will offer a Multi-Sport & Adventure Camp this summer for kids entering grades K-5 and 6-8. Camps will be held at the SRC at CSU-Pueblo from 7:30 a.m.-5:30 p.m. Mondays through Fridays. Half day sessions also are available from 7:30 a.m.-noon or noon-5:30 p.m. Participants will enjoy a variety of sports and adventure activities with an emphasis on FUN, learning, and participation. Six sessions will be offered throughout the summer during the following weeks: June 5-9, June 12-16, June 19-23, June 26-30, July 10-14, and July 17-21. Each day will consist of a variety of recreational experiences in short increments to ensure active participation among campers. Children will rotate stations and be taught and monitored closely by camp counselors. Campers are required to provide their own sack lunches and snacks. The combination of competitive prices, flexible schedules, state-of-the-art facilities, and enthusiastic staff will keep you and your child happy this summer. K-5 campers will participate in on-campus activities such as: basketball, crafts, climbing, swimming, biking, zip line & challenge course. Campers in grades 6-8 will participate in those activities as well as leadership development opportunities and field trips to Lake Pueblo, the Nature and Raptor Center, and Beulah Mountain Park. Daily, weekly, and extended care pricing is available as well as multi-child discounts. All registration forms and additional information for the camp are available at www.packmultisportscamps.com. For questions, more information, or to register, contact bill.moorman@csupueblo.edu or call 719-549-2087.